Internationally known artist, Frank Boyden has exhibited his work in museums and galleries throughout the United States, Canada, and Europe. His artistry moves easily from sculpture to ceramics to printmaking. In this exhibition, Boyden focuses on etchings with a series of 96 drypoints. These intimate portraits–46 of them male, 46 female–explore a range of the human psyche. Described by Frank as “small and gnarly,” these images are immensely powerful for their size (the plates measure only 3” x 2”). Much art through history has depicted the seedy, darker side of humanity in a variety of ways: invoking pity and empathy by unveiling the absurdity of the human condition. Boyden here takes his own artistic journey over many months through a process that demanded an evaluation of himself and his surroundings. The result of his revelations is profound and haunting. A native Oregonian, Frank Boyden graduated from Yale in painting in 1968. 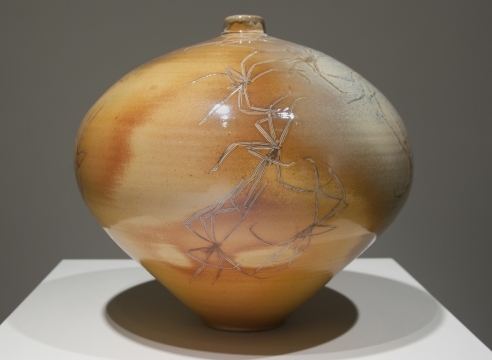 He taught at the University of New Mexico in the late 60s where he became hooked on ceramics. He returned to the Oregon coast to live and founded the Sitka Center for Art and Ecology: a school for environmental studies. Boyden’s work is in collections including the Smithsonian Institution, Washington, D.C.; the Pushkin Museum in Moscow; Museo de Arte Costarricense of Costa Rica; the Portland Art Museum; the Tacoma Art Museum; and Oregon Health Sciences University in Portland. Major sculpture commissions include; the Hult Performing Arts Center, Eugene; the Oregon Coast Aquarium, Newport; Portland Community College Rock Creek Campus; Doernbecher Children's Hospital, Portland; and Tri-Met Transit Authority, Portland.